Our Clinical Director and Senior Behaviour Consultants are certified by the Behaviour Analyst Certification Board. 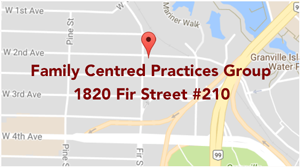 Family Centred Practices Group provides supervision and mentorship to Senior Behavioural Interventionists/Junior Consultants and Behavioural Consultants working in collaboration with the group. If you are interested in a position with the Family Centred Practices Group and in receiving BCBA supervision, please contact us.